Herefords are an ancient breed, kept in Herefordshire in western England for centuries. They gained their modern appearance around 1800 by crossing with cattle from Flanders. Originally, Herefords were large framed draught cattle, some weighing over 3,000 pounds. During the nineteenth century there was selective breeding for early maturity, which entailed a reduction in the size of the frame. The first breeding herd in America is considered to be one established in 1840 by William H. Sotham and Erastus Corning of Albany, New York, and for practical purposes Herefords in the United States date from the Sotham-Corning beginning. The more densely populated eastern area of the United States, including herds in New England, was the early home of Herefords. From there, they fanned out to the South and West as the population expanded and the demand for beef increased. It was largely through shows and expositions that Herefords gained their greatest acceptance among cattlemen of this country and, no doubt, the first great impact was scored at the 1883 Chicago Fat Stock Show, the forerunner of the famous International Livestock Exposition which, until closing after the 1975 event, was the premier show for market animals in America. 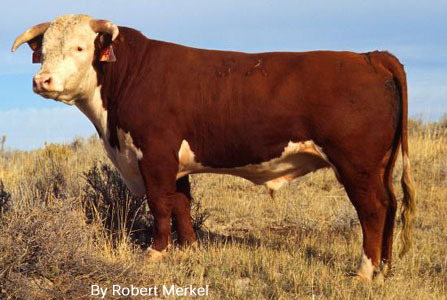 Hereford are medium framed cattle with distinctive red body color with the head and front of the neck, the brisket, underside, and switch in white. They have well developed fore-quarters, a deep brisket, broad head and stocky legs. Most animals have short thick horns that typically curve down at the sides of the head, but there is a polled strain in North America and UK (Polled Hereford). Herefords are generally docile and fast growing cattle with good beef quality.